This blog post has been in limbo, hiding among some old drafts, so it’s a bit late. Apologies! In the wake of the AZ shooting of Gabrielle Giffords, The Chronicle of Higher Education published a review of Erich Gruen’s Rethinking the Other in Antiquity. 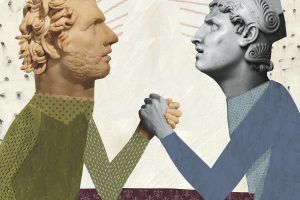 The review juxtaposes Gruen’s reinterpretation of ancient attitudes toward the Other with the contemporary constructions of the Other in American politics and finds that the ancients come off surprisingly better than one might have thought. The entire thing is well worth reading. Below is an excerpt of the specifically classical bit. “Us against them” seems a staple of human psychology as unsinkable as “That’s mine!” for a 3-year-old or “I wish they’d quiet down” for a senior citizen surrounded by teenagers. The problem remains that this habit of hostility to the “Other” seems inescapable, even if it’s not hard-wired into us. We’ve been talking like Tarzan since the ancient Greeks. Me Athenian, you barbarian. Me Roman, you Carthaginian loser. Me Greek, you dumb Egyptian animal worshiper. Me better, you worse. Rethinking the Other in Antiquity, by Erich S. Gruen, out this month from Princeton University Press, like all excellent scholarship massages the mind in useful new directions. Gruen, a Berkeley professor emeritus of history and classics, wields his command of ancient sources to shake a widely shared historical belief—that ancient Greeks and Romans exuded condescension and hostility toward what European intellectuals call the “Other.” For those Greeks and Romans, that largely meant peoples such as the Persians, Egyptians, and Jews. Even if Gruen doesn’t wholly convince on every ground that Greeks and Romans operated like Obamas in togas, regularly reaching out to potential enemies, his careful readings of Aeschylus, Herodotus, Tacitus, and others introduce us to a kinder, gentler ancient world. His analysis confirms how even back then, tossing people into a category and then hating them en masse was a choice, not an evolutionary necessity.